Are you a Christian in business? Do you own your own business? Are you interested in starting a business? 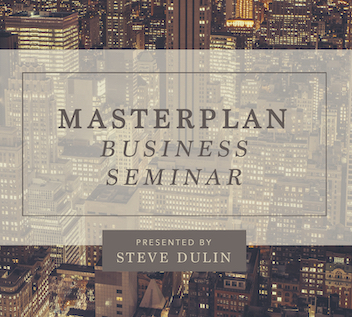 If so, the MasterPlan Business Seminar with successful businessman Steve Dulin is for you. This isn’t another seminar about sharing your faith in the marketplace. This is a seminar about doing things God’s way so you can reach your God-given potential as a businessperson and be blessed in every area of life. Whether you’re a leader who wants to maximize the success of your team, an owner who desires to run your business God’s way or a businessperson who wants to take things to the next level, this will be a valuable resource for you. The MasterPlan Business Seminar MP3s feature audio recordings of the MasterPlan Business Seminar, presented by Steve Dulin. Once you complete your purchase, you will be able to instantly download the MP3 files and begin listening to the seminar. Problems downloading the files? Contact us at info@masterplanministries.org. The Masterplan Business Seminar Self Study Plan includes accompanying questions to the MasterPlan Business Seminar so that you can best apply the principles in the seminar to your business.